One of the greatest things about the blogosphere is meeting new people. One day I stumbled across Susan DiMickele’s new book, so I looked up her blog. We connected, and it’s been so much fun to watch another author enter the publishing world just about three months ahead of me. 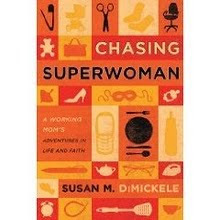 I interviewed Susan about life and her new book, Chasing Superwoman: A Working Mom’s Adventures in Life and Faith. Before we get into the interview, don’t stop reading if you’re not a working mom. (First of all, we ALL are! What mom doesn’t work?) Not only that, all of moms share certain things, whether we work at home, for our family, outside the home, part-time, full-time, whatever. One of the things most of us struggle with is the Superwoman complex – the desire to do it all, perfectly. In addition to that, if we want to “share the grace,” we need to understand how other mothers work and deal and live. So, keep reading – and pick up a copy of Susan’s book if you’re not the giveaway winner. I was tired of trying to be Superwoman -- constantly juggling my career, my family, and my faith. As important, I wanted working women of faith to know that they’re not alone -- even though it often feels that way. And, as followers of Christ, we can be passionate about our careers AND our families. On a lighter note, I also wanted to write with raw humor about the unedited moments of motherhood -- to remind us that sometimes we just need to let ourselves laugh. HOW did you write this book? You have to be incredibly busy! I wrote during every spare moment, gave up sleep, and probably missed out on more than a few social opportunities in the process. I tried not to sacrifice time away from my children, although when it came down to the wire, they certainly knew that Mommy had to finish her book. What does your book have to say about faith? As a working mom and a committed Christian, I’ve candidly struggled with my role in the church. In fact, I’ve written an entire chapter about it! Mothers who work outside the home already struggle with enough guilt -- and right or wrong, it’s easy to feel like an outsider in church when you don’t fit the mold of the Church Lady. And most stay-at-home moms I talk to are likewise tired of the same kinds of stereotypes that cut the other way. I do think we need an authentic dialogue. We’ve come a long way in building bridges for all mothers -- but we still have a long way to go. I’d say all moms are guilty of the expectation trap, and I know that’s even harder for working moms. What are some things you have to say about that? Tell us what your blogging experience has been like. I didn’t launch a blog until several months before the publication of Chasing Superwoman. A blog was the logical “next step” in my writing journey, and I wanted to connect with other writers and especially other mothers. But I put off blogging as long as I could because I felt like I didn’t have the time. How could I possibly add one more thing to my schedule? Now that I’ve been blogging for about six months, I’m hooked! Sure, it’s a time commitment but I’ve built some great relationships and have found it well worth the investment. Blogging is a great way for moms to connect because we can work blogging around our schedules. I may never make an evening meeting or weekend Bible study -- but I can blog when the rest of my family is sleeping! Do you have a favorite chapter in the book? My favorite chapter is probably Chapter 14, Devoted Mommy. Despite the many hats I wear, my mommy hat is definitely my favorite. Chapter 14 is probably more personal and less universal that many of the other subjects I write about -- like work, school, church, and multi-tasking -- but at the end of the day, the thing I want to be known for most is being a devoted mother who raises her children to know and love God. It’s my passion. Is this just your story, Susan? Chasing Superwoman is my story, but I also believe it’s the story of many working mothers who are trying to make sense of a world that is pulling us in so many different directions. Shortly after my third child, Abby, was born, I was ready to throw in the towel in just about every area of my life. I was burning the candle at both ends, sleeping little, working long hours, and feeling like I was trying to be too many things to too many people. In my state of utter exhaustion and weakness, I reached out to God and asked, “Please tell me you have a purpose in all of this.” Hence the idea for Chasing Superwoman was born. Looking back, He’s the one who reached out to me. And He’ll reach out to you too. If you’re in the middle of a journey and you don’t know where it’s headed, hang in there and keep trusting. God has a purpose and a plan! I’ve read Susan’s book cover to cover and it’s great. I laughed out loud, nodded my head, sighed, and teared up right along with her. I think you will, too. Chasing Superwoman is available on Amazon and your local Christian bookstore. You can visit Susan at A Working Mother’s Daily Rant. If you’d like to enter the giveaway for a copy of Susan’s book, just leave a comment on this post before midnight on Thursday, June 24th. I’ll do a random drawing and announce the winner on Friday. She's inspiring! Love her blog and can't wait to read Chasing Superwoman. Thanks, Laura, for sharing! Terrific interview, Laura. The book sounds amazing as does it author. I just found your blog last Friday and I am already hooked! It sounds perfect for just about every woman I know! I look forward to reading it! And congrats to Susan! Congrats to Susan for finding the time to write a book (major accomplishment!) and congrats to you, Laura, for a terrific interview. I felt like I was eavesdropping on a chat. Laura, I can't thank you enough for the friendship and support. Thanks for sharing this journey with me! This sounds like a great book! I can certainly relate to her sentiments, as I'm sure most women can! I think this is something many women struggle with. I'd love to enter to win a copy. Aww, Laura sounds like a great book. Thanks for the review. Love how you interviewed her, Laura. good questions. and really like the sound of her book. Thanks! This sounds like a fantastic and very encouraging book! Thanks for such a great giveaway. How did I miss this on Monday? The book sounds terrific, and I can use all the help I can get. Thanks for the chance to win! I'm having my first baby at the end of July/beginning of August, and then starting my very first job at the end of August. I have a feeling I'm going to NEED this book!!! Thanks for bringing it to our attention - sounds great!